Our Economy Saver 1-3/4 inch wide Titanium Coated Bi-Metal Saw Blade joins our family of long lasting Universal cutters. The introduction of Titanium coated blades has elevated the all-purpose cutting capability of multi-tools and now we've got them for standard fit Release multi-tools too. With this long lasting Titanium blade you can cut down almost anything, from nail embedded wood framing to steel screws and bolts. The 45 mm width of this blade is ideal for maintaining critical cutting contact as you oscillate through fiberglass, PVC, copper pipes, metal mesh and thin sheet metal. Use this blade as a demolition or a control precision cutter for either Flush or Plunge cutting situations. The Titanium coating is applied in extreme high heat for long lasting protection of your cutting teeth. 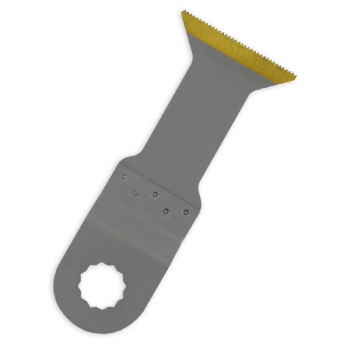 This Price Saver R450T Titanium Coated saw blade is a long lasting Universal multi-purpose cutter. And having a 1-3/4 inch wide blade that can plunge 2-1/4 deep makes it ideal for demolition or precision cutting of nail embedded wood materials. Made with a proprietary blend of high speed steel and alloy steel, coated with titanium.